Hi! I’m Jeanne Jachna! I am so excited to be a guest designer for Right at Home! I’m smitten with dies so when I was asked to work with the new Seasonal Wreath Die Set I was all in! This die set is so versatile! It comes with a wreath and lots of different elements to embellish it for just about any season you can think of. There are flowers for spring and summer, leaves for fall, and poinsettias and ornaments for Christmas. Just by changing the colors of the images you can create so many different looks ! I started by cutting all the elements in different colors of card stock. I cut all the leaves at one time from yellow, again from green etc. This way you accumulate lots of leaves in different shades to use for several projects instead of cutting one leaf at a time in the desired shade. I added the veins to only some of the leaves so it wouldn’t get too busy. This set has so many possibilities!! I didn’t use the wreath die at all on my card! I shaped a wreath from all the different shaped leaves in the set.. I made sure to cut the sweet little acorns in a contrasting color so that they would stand out. I used the little “dots” for berries, but they look great as flower centers too! 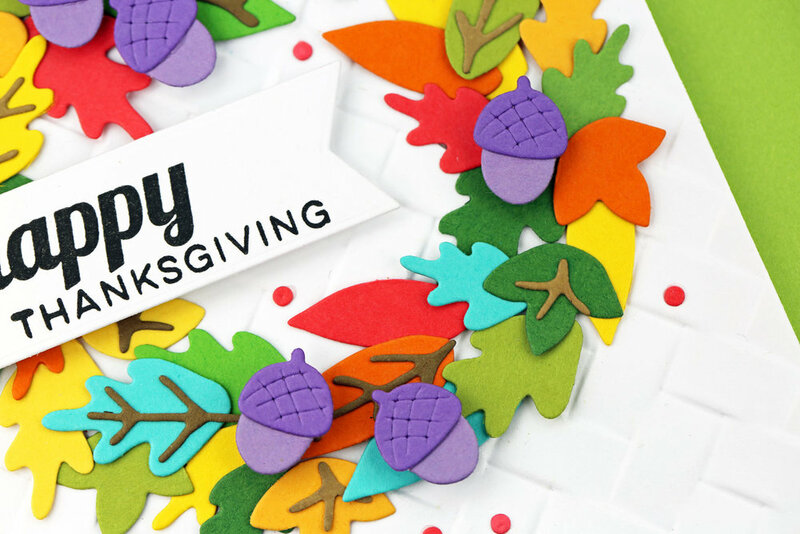 The Happy Thanksgiving sentiment is from the Fall Sentiments Stamp Set. I love setting a big table for Thanksgiving and will use the left over die cuts to embellish name cards for place settings! You’re going to want to keep this set handy because I think you’ll be reaching for it again and again all year round!